Last week when it was raining I enjoyed the soft warble of a magpie wallowing in a warm shower. On most days the rainbow lorikeets keep up their colourful chatter outside the window. For a busy Sydney suburb the bird life is quite active. 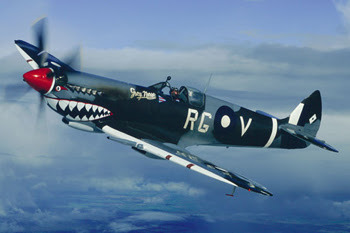 But today the bird in the sky that caught my ear and eye was a Spitfire. Not once (I missed the initial pass but there was no mistaking the sound of an unmuffled V12 growling past), or twice but thrice. In fact an indulgent four flights since he slipped past over a couple of hours earlier, heading north on idle. This fly-past had a bit more soup to it. And he hung around the suburb for a few minutes before disappearing West. 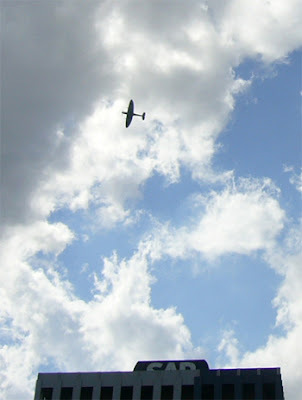 In this photo he was coming back for his second pass over our neighbour’s building. Its moments like these you wish you had a real camera! But there is no mistaking its wing form. Turns out it was an overflight to commemorate one of Australia’s war time aviation “greats”, Wing Commander Robert Henry Maxwell “Bobby” Gibbes DSO, DFC and Bar, OAM, born in Young, New South Wales, on 6 May 1916. He passed away on the 12 April. The following notes summarise a more comprehensive tribute found at the Temora Aviation Museum website. With war looming in Europe Bobby reported to No.4 Elementary Flying Training School RAAF at Mascot on 5 February 1940 as an Air Cadet and eventually posted to 23 Squadron at Archerfield, Queensland which was equipped with Wirraways and Hudson bombers. Here he honed his skills and was assessed as an “Above average fighter and fighter bomber pilot”. He was posted to Williamtown, NSW to become Adjutant of the newly created 450 Squadron with the rank of Flying Officer. After an intense period establishing the units command and support structure it embarked for Egypt where it arrived in May 1941. Three days later Gibbes was posted to 3 Squadron RAAF at Lydda. Gibbes participated in the squadron’s opening engagement of the Syrian campaign in an attack against the Vichy French Air Force Base at Rayak. He rose to command 3 Squadron and finished his North Africa tour with 10 1/4 aircraft destroyed in air to air combat, 5 probably destroyed, 16 damaged and 2 destroyed on the ground. With the North African campaign over he returned to Australia where he was posted to 2 Operational Training Unit in January 1944. A quick operational mission to New Britain with 77 Squadron was followed by the busy and sometimes hair-raising task of operational training on P-40s, Spitfires, Boomerangs and Wirraways. As a final tribute to Bobby’s service to the RAAF, to Australia and to aviation, the Temora Aviation Museum undertook a rare fly-past over his service at St Thomas’ Anglican Church at North Sydney. This was a rare event for the Museum as its aircraft are not flown over built up areas. 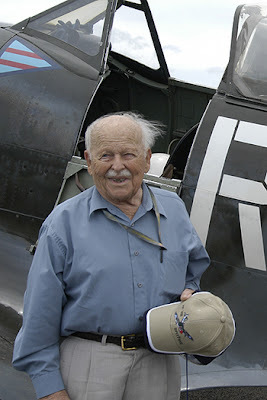 However, in this one-off instance the Spitfire provided a final tribute to this great Australian who continually risked his life in the skies over North Africa and the Pacific. And here is a nice touch – the museum happens to have a flying Spitfire MkVIII painted up in the colours of Bobby’s war time Spitfire. Here it is. It was nice to be part of the farewell, even if only from the balcony of our office. Vale Bobby Gibbes.